I've been so busy studying for tests and writing papers that I haven't had much time for guide writing. Sorry! 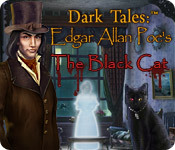 Anyway, I saw the next edition of the Dark Tale series, also known as the Edgar Allan Poe series, and I thought I'd at least review it for you. Having played one of the earlier ones and enjoying it, the game follows the same pattern. This game appears to have even more places to explore than its predecessor, with a lot of going back and forth between scenes to solve puzzles. So, what did I like about the game? First, the hidden items were anywhere from easy to hard to find. Second, the storyline was consistent and interesting. Thirdly, the areas of interest - generally known as the sparkly areas - challenge your ability to use logic and solve problems. Fourth, I found the puzzles moderately hard to challenging, but you can skip them. Last but not least, the graphics are amazingly real and the ambience is very spooky. What didn't I like about the game? Well, there wasn't much. You can only utilize hints in hidden object areas, not in other places. That was about my only complaint. I highly recommend this game, especially if you've played other Dark Tale games. However, it's not someone who's looking for an "easy" game! This game will challenge even the best hidden object enthusiast!